Are you a “Now” or “Later” person? When you’ve undergone some test or maybe an MRI scan do you prefer to get the result/report as soon as it is available or do you prefer to wait until you see your consultant? I’m definitely the former. I like to know what could lie ahead so that I can come to terms with the worst scenario and then, if reality is actually not as bad, result! 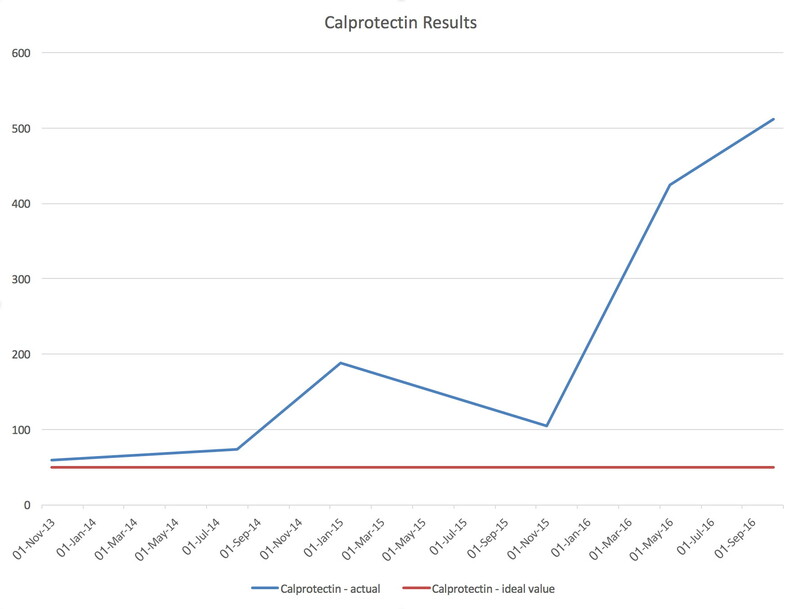 When it’s something like a calprotectin test then it’s simple to compare the new value to previous ones and identify the trend. (I dropped a sample into the Path Lab for analysis just before Christmas and should be able to get the result soon). The problem comes when you read a report that is well beyond one’s own limited medical knowledge or experience. I had such a report arrive in the post last week. The MRI scan itself was carried out at the end of last July but if you’ve read my previous couple of posts you’ll see that there was an apparent conflict between it and a subsequent colonoscopy. I had asked my consultant to send me through the text and he duly obliged. 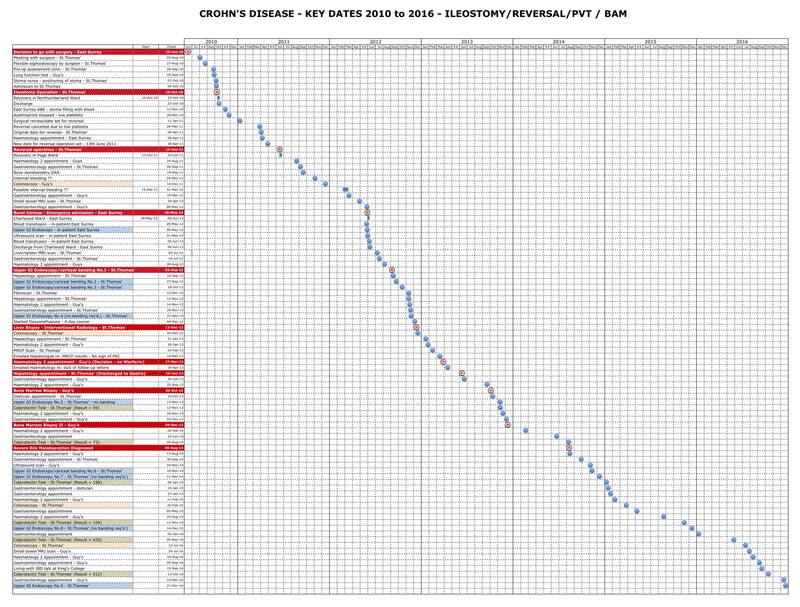 Comparison is made with the previous MR in April 2012. Previous ileocolic resection again noted. As before a further stricture is seen in the proximal transverse colon measuring 10 cm in length, with slightly less mural thickening than before. Moderate prestenotic dilatation of 4.8 cm is seen. There is further stricture seen in the ascending colon over a length of 5 cm. Mild mural thickening and oedema is noted in the caecum and distal 5cm of the terminal ileum as previously. The small bowel loops are suboptimally distended, with the impression of adhesions between the small bowel loops and anterior abdominal wall. No definite further strictures or active small bowel disease is seen. Mild splenomegaly is demonstrated at 15 cm as before There is a mild atrophy of the pancreas. Gallstones noted within a slightly thickened gallbladder as previously. Solid organs otherwise unremarkable. No intra-abdominal collections. Small trace of fluid within the pelvis. I can understand this reasoning and, having read the above I’m starting to think that maybe that’s the way forward. There are four words in particular make me wonder what lies ahead – “stricture”, “fistula”, “adhesions” and “penetrating”. I’ve experienced them all before and it ended up with surgery. If I need further episodes under the knife then it’s not really a surprise. My consultant quotes the average time between surgeries for Crohn’s patients as 10 years. I’ve reached six and a half from the ileostomy, but before then (perforated bowel) it was 30 years. Next time I see my consultant it should be an interesting conversation. How much of the report could have been expected given my past history? Are there any pointers to the progression/reawakening of Crohn’s disease? What next? Does it point to surgery sooner rather than later? As the date for the appointment drew closer my stress level increased. Not from the potential medical implications (though some might doubt this!) but the pure logistics of getting to London by 10:20am. It shouldn’t be a problem until you realise we have to rely on Southern Rail actually running a train. As it turned out my train was exactly on time but afterwards there were no more heading to London for 2 hours. Having arrived at Guy’s Hospital with five minutes to spare I was greeted by a nurse who explained that the clinic was running 45 minutes late. I asked her to put a note on my file that I wanted to see my usual consultant (the top man). The wait increased to just over an hour when I heard my consultant calling my name. TIme to see if there were some answers. I produced my list of questions/comments. We started out by discussing the outcome of the MDM. Had they been able to reconcile the apparent contradiction between the colonoscopy results and the MRI scan? No, they were at a loss to explain the differences. The MRI report noted a 100mm stricture in the transverse colon and another in the ascending colon. Neither had been apparent from the scoping. The scan also showed adhesions, one of which was between intestine and bladder. This could potentially lead to a fistula developing between the two. The tell tale sign would be gas when passing urine. That was a new one on me and certainly not something I had experienced so far. The word that worried me was “fistula” but he pointed out that it was a possibility not a certainty. The options left were to repeat the colonoscopy, or the MRI scan, but a barium enema, which is a test designed to look at the colon, would be preferable. (Not sure for whom. I still remember the last one over 30 years ago.) Rather than going straight to another procedure he suggested that we carry out a calprotectin test and if the result was the same or higher than last time (512) then it would be time to start practicising the buttock clench, so vital for the enema. He asked how I felt generally. My answer was “very well” apart from every 10 days or so getting an upset stomach for half a day then back to normal. There was also an incident when I seemed to be leaking fresh blood but it only lasted a day and I concluded it was purely mechanical, maybe a burst blood vessel. He agreed with my conclusion. I explained that I was keen to remain drug free having been taking no Crohn’s medication since 2010 (post-ileostomy). Was that an option with mild inflammation? Yes. The aim would be to start treatment early enough, to avoid surgery, should the inflammation worsen. (The knife is always a threat though). In line with my aim of not taking any new drugs I hadn’t been to see my GP about starting Questran for Bile Acid Malabsorption. I would remain on just Loperamide and adjust the dosage accordingly. The one question I forgot to ask was “Does my reaction to Azathioprine (bone marrow suppression) suggest that some of other common drugs may be unsuitable?” That will have to wait for the next appointment. 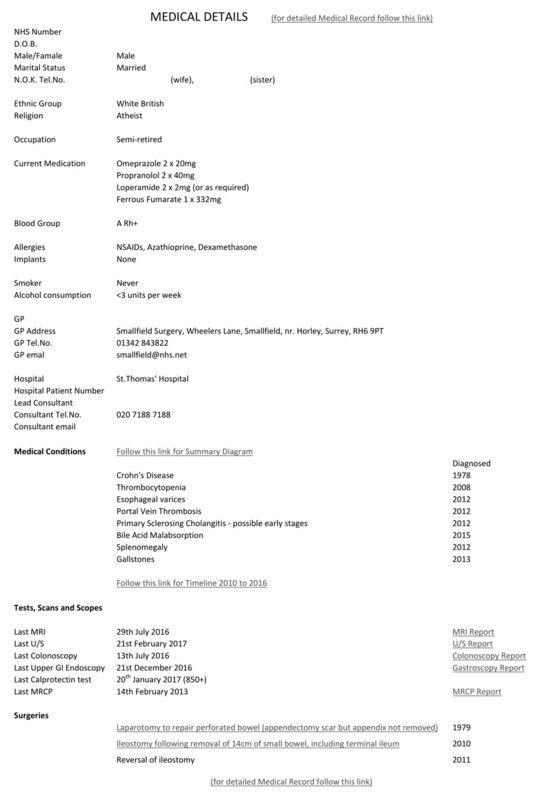 I would be having my annual upper GI endoscopy at St.Thomas’ the following week and was wondering if we should also be monitoring my liver for stiffening (PSC). He said I should ask the endoscopist as it was their specialist area. The visit would also give me a chance to drop off the calprotectin sample to the path lab. I would then need to email my consultant in mid-January to get the results. Fingers crossed for <512. Clench. At the end of the appointment I mentioned that I had eliminated a major element of stress by no longer commuting to London and have virtually retired. As I now had time in my hands I would be keen to do something for the IBD Community. What is so nice about these appointments is that you never feel rushed. Every question gets a considered answer and all decisions are made jointly. Excellent. After the appointment it was off to have lunch with a fellow IBD sufferer and then on to meet up with an old colleague for a coffee before attempting to get a train home. Do you have a “quotation that inspires you”? The one I would choose is probably not an obvious one for a health blog. You might have been expecting me to have trawled through the “inspirational” websites to find some relevant, life affirming words. I hope you’re not disappointed…. Bear with me, it will become clear. To illustrate the point I’m using one of my favourite subjects – bile acid malabsorption (BAM). Maybe “favourite” isn’t the right description, make that “a subject I have felt the need to write about several times before”. There’s barely a day goes by when I don’t see a comment, on one of the IBD or BAM forums, from someone who has just been diagnosed with BAM and many times the post goes on to say that their doctor had never heard of the condition before. That’s the first hurdle to overcome. I am a fellow sufferer as a result of losing my terminal ileum. (I had an ileostomy back in October 2010). Before the operation I was offered the chance to take part in an Enhanced Recovery Scheme at one of the top London hospitals. 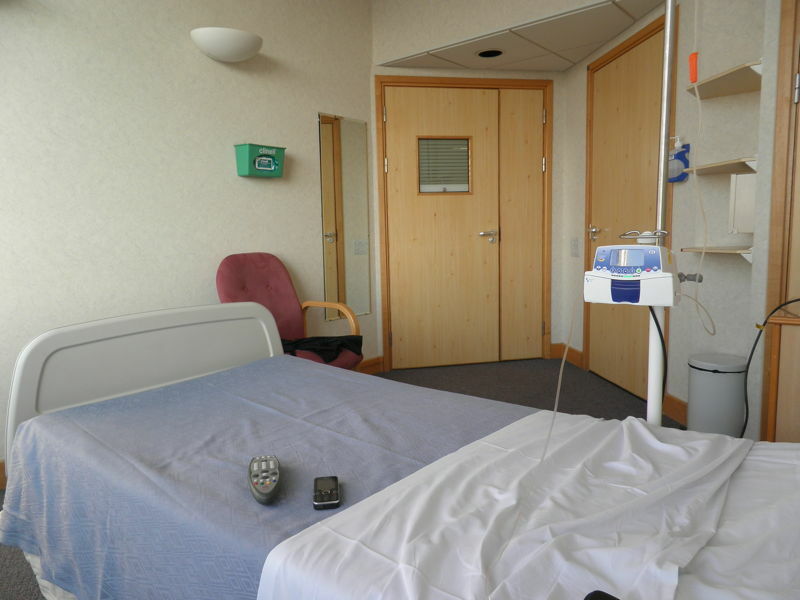 Part of the ethos behind this regime is to fully inform the patient of what will happen at all stages of the process – pre-op, during the hospital stay and beyond. Was I told about BAM before the operation? I’d have to answer “maybe” and this brings us to the point of this post. Let me explain…. I was told that after the operation absorption of vitamins and salts would be much reduced due to lack of a terminal ileum. The surgeon repeated this message on his ward round post-op. If someone told you that your body wouldn’t absorb salts properly what would you take that to mean? I took it at face value, I would need to up my intake of salt (sodium chloride) to compensate and take supplemental vitamins. I didn’t see the need to question the statement as it seemed very clear. It wasn’t until I was diagnosed with BAM (4 years after the ileostomy) that I found it has an alternative name “Bile SALT Malabsorption”. Suddenly the comment about not absorbing “salt” took on another meaning. You can see the problem. This is where Donald Rumsfeld comes in. I heard what the Enhanced Recovery Nurse and the surgeon told me. I understood what the words meant – to me. I didn’t appreciate that I didn’t understand what the words meant to them. From their point of view – they were using their everyday, medical terms to describe a likely problem to a patient. From this experience I have learnt that you must always question what you are being told and do your best to get the doctor, consultant or surgeon to explain, in simple terms or non-medical terms, exactly what they mean and what they perceive the implications to be. I keep coming back to those particular words in the quote “there are things we don’t know we don’t know.” Try repeating them to yourself as you enter the consulting room….. The operation time slipped from the 11:30am originally planned but eventually I was collected from the 12th floor and arrived down in the anaesthesia room at 12:30pm. The theatre team were ready for me and started the preparation procedures. They seemed to be a very happy crew, laughing and joking and that helped put me at my ease. The anaesthetist I had met earlier then appeared. He greeted me with a broad smile and said he was ready to fit the epidural. Once that was done he said I’m just going to give you a mild sedative to relax you. I just drifted off into oblivion. Never trust an anaesthetist. That’s the last I remember until waking up at six o’clock in Recovery. It was freezing. I was feeling no pain as the epidural was doing its job well but I was freezing. Shivering. Violently shivering. The house doctor, that I had seen in my room that morning, came up to see how I was. His first word was “Sorry…” so I knew what was coming. He told me it was a four and a half hour operation and that because of what they found when they opened me up it was necessary to have a stoma in order to give my large intestine a chance to recover. He lifted the blankets so I could see what they had done. It didn’t really come as a shock as I always knew it was a possibility and was mentally prepared for it. I can imagine what it would have felt like if I hadn’t been forewarned. By late afternoon my wife was starting to get concerned. It must be a lot worse for those sitting at home waiting for news than the patient who is comfortably numb. She hadn’t had any news on how the operation went so she rang the Ward. They told here that I hadn’t arrived yet but would call when they knew what was happening. Just gone six thirty a doctor rang to tell her that I was OK. It had been complex surgery and I was still in Recovery. The Team in Recovery were concerned about my readings, especially the temperature. At one point I had a “bair hugger” put round me which is a hollow blanket into which hot air is blown. Now I know what a formula one tyre goes through on the grid. I was offered a warm drink just a couple of hours after the operation. No more “nil by mouth”. It wasn’t until I was finally wrapped up in a large, microwaveable blanket that my temperature began to return to normal and I could be taken up to the ward. By now it was around eight o’clock. 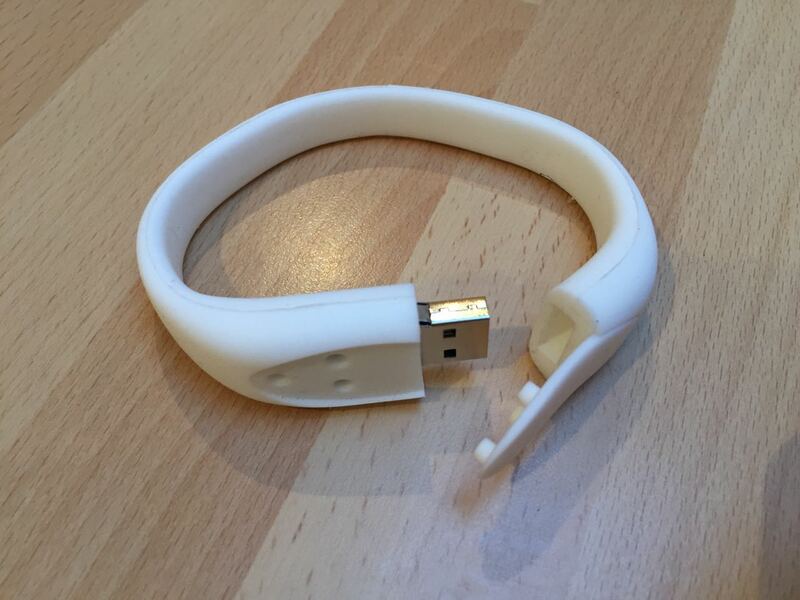 Another huge change over the past few years is being able to use a mobile phone in hospital. I suppose it was inevitable as people would use them whatever. I asked the nurse if I could get my phone so I could ring my wife. As I explained earlier, they had locked my valuables in the ward safe and the night shift didn’t know the combination. Very frustrating. 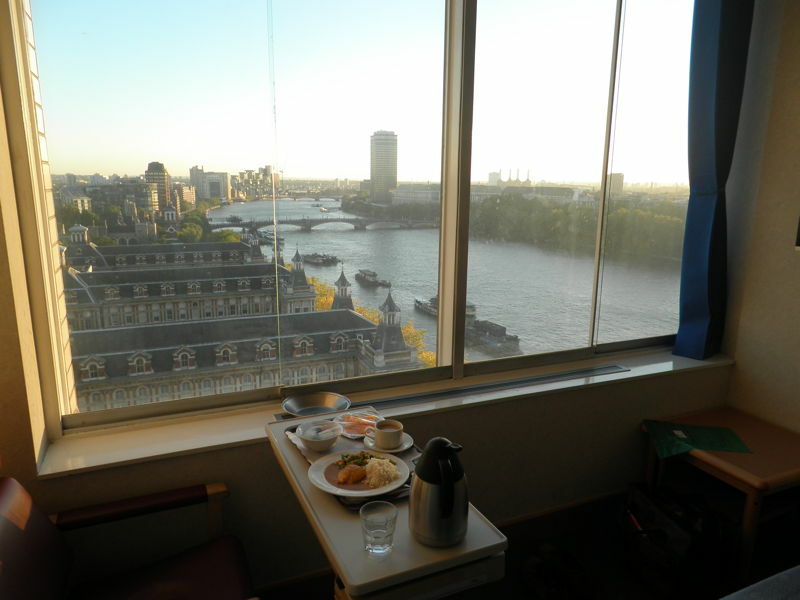 I was taken to Northumberland Ward on the 11th floor, where I spent the rest of my stay. I had been expecting to be put in Page Ward, as that was the ward specialising in colorectal surgery. Unfortunately there were no beds available so I was put into the sister ward next door where they specialised in upper GI conditions. The house doctor came to visit me again to see if there was anything I needed. I asked him if he could ring my wife and tell her I was safely up in the Ward. He had a number of other things to take care of first but eventually she got a call at eleven thirty……..
Post Op Note : I never fully understood exactly what the operation involved. Earlier this year I contacted one of the surgeons and using the operation notes and pathology report, he put together this sketch for me. 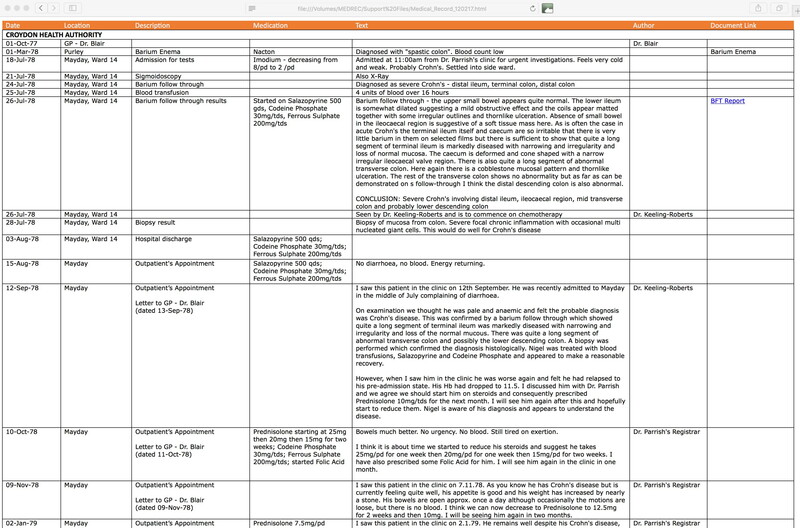 At the moment it makes a change to write a post not connected to the #HAWMC (Health Activist Month Writer’s Challenge) that I’ve just completed. Having said that, there is still a link because I have mentioned in a couple of those posts that I find blogging therapeutic. It helps me to be objective and get things straight in my mind. This post is therefore primarily for my own benefit but any thoughts/comments/questions welcome. 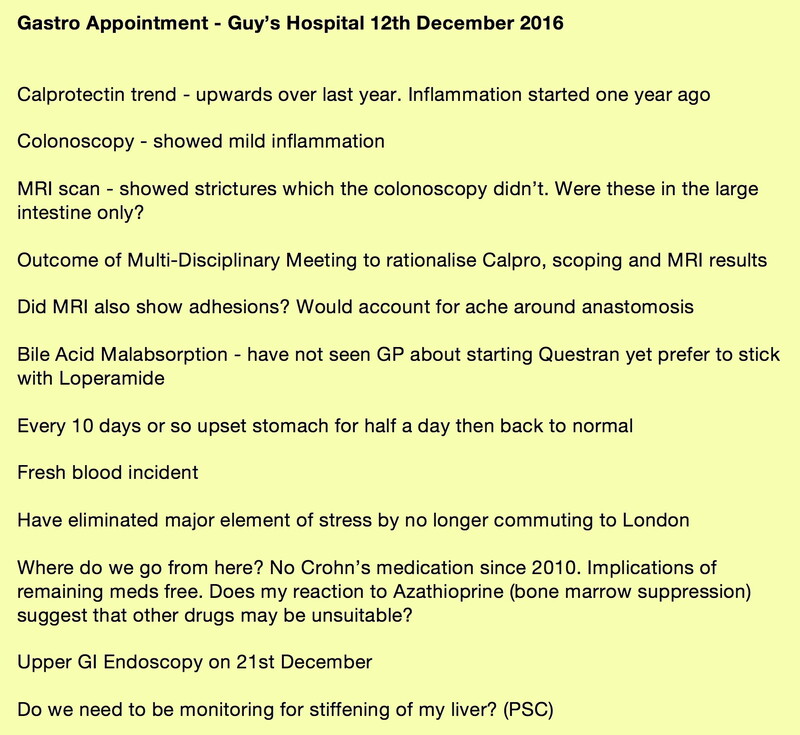 I’m off to see my gastro consultant at Guy’s Hospital in just over a weeks time (12th December). I’ve already started getting my list of questions ready but I want to make sure I capture all the relevant details. I’m expecting us to agree next steps given my recent test/procedure results. Since my reversal operaion in June 2011 I’ve been taking no Crohn’s drugs at all and everything has pointed towards me being in clinical remission. I really don’t want to take any more medication than the current Omeprazole, Propranolol, Loperamide and iron tablets that I am on for PVT (Portal Vein Thrombosis). When I my consultant, almost a year ago I said “I feel fine. I can’t see why we shouldn’t stretch these appointments out to yearly intervals.” I don’t know exactly how long it was before I started to regret it, probably about three months, as the bathroom dashes had returned. As ever, with IBD/Crohn’s, it’s not easy to pinpoint what has caused the change and now that I have the addition of Bile Acid Malabsorption to consider it makes it even more difficult. The upshot was that I emailed my consultant and explained the problem. He suggested a calprotectin test (stool sample) and we would decide what to do next depending upon the result. After three weeks (28th May) the test report came back showing a considerable jump upwards to just over 400, suggesting active inflammation. Because a colonoscopy can only just reach into the small bowel an MRI scan was booked to look at my small bowel. I didn’t have to wait long – 29th July with a follow-up appointment on 5th September to discuss the results. Suprisingly, the MRI showed a stricture in my colon even though the scope didn’t. Very strange. This conundrum would be put to the Gastro Dept’s next MDM (Multi Disciplinary Meeting). The MRI scan also showed adhesions, which are usual after surgery, but I would like to know a bit more about locations. I’ve been getting an ache around ny anastomosis for a number of years but it seems to be worse in the last week or so. This may be down to lifting a couple of “heavier than they looked” objects. Yes, I know it was stupid but male arrogance etc…..
I’m intrigued to know how the MDM reconciled the apparently contradictory colonoscopy and MRI scan results? I would have thought the camera results would take precedence. 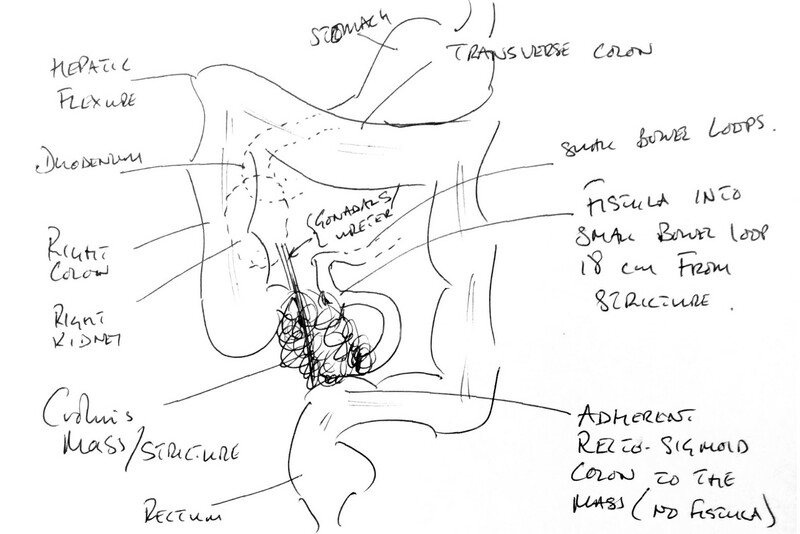 I also need to understand if the adhesions, on the scan, are just confined to my rejoin (terminal ileum). We’ll talk about their conclusions on 12th December. We also discussed the large jump in calprotectin level and he asked me to repeat the test to check whether this was a rogue result. Unfortunately the result, when it came back, was even higher. Looking at the calpro graph it’s apparent that somewhere between November 2015 and May 2016 the inflammation restarted. I mustn’t forget to mention that a few weeks back I was having a “do I call an ambulance” moment when I started loosing some blood from where the sun don’t shine (no, not Manchester). I concluded that due to the fact it was bright red it must be very fresh and the result of surface injury and did not warrant 999. By the next day I was fine again. Over the last few weeks my digestive system seems to be back on an even keel so is it possible/advisable to continue without medication even though mild inflammation is present? Is any damage done by not taking medication for such a long time? Does the calpro trend suggest that the inflammation is getting worse? I have noticed that I can sometimes feel the action of peristalsis across my middle which I’m assuming is matter passing along the transverse colon. Maybe this ties in with the mild inflammation. I will mention that I have not talked to my GP about Bile Acid Malabsorption as my digestive system seems to have returned to normal with just the odd blip every 10 days or so. Is this return to normality as a result of no longer commuting to London? I’m booked in for an upper GI endoscopy on 21st December to monitor the growth of varices in my esophagus. I’m wondering if we should be doing any further monitoring of my liver to look for worsening of the cirrhosis. Add it to the list. I just need to turn the above into a succinct list and I’m ready for the appointment. I just hope the newly announved ASLEF ovetime ban doesn’t stop the trains from running. It should be an interesting session on 12th. This is an extract from the chapter that covers the immediate period before major surgery for a stricture in my terminal ileum. My final visit to St.Thomas’s, as an outpatient, before the operation. I had to visit the stoma nurse in case I ended up having to have a bag fitted. Obviously I was hoping that it wouldn’t happen but you need to cover all the bases. As the saying goes ” Sh*t happens”, and it’s quite relevant in this case! We started by discussing all the implications of being stoma’d. She told me they were not that difficult to deal with and it should only be for 6 months. She then looked at my physique (= bulges) and how I wore my trousers so she could position the stoma in the optimum place. Once she was happy with the location she marked it. I now had a large black cross on the right side of my abdomen, marked with indelible felt pen and covered by a waterproof sticker. I was still hopeful that it would be intact after the operation. I told the nurse that I intended to keep my blog going whilst I was in hospital. She looked rather sceptically at me and said that for the first few days I would have an attention span of about 5 minutes and it was unlikely that I would feel like doing anything. She was partly right. I asked what time my operation was likely to start. Surgery usually began at 8:00am but until they saw the full list of operations they wouldn’t be able to tell me where I would be in the sequence. They might have a better idea when I was admitted on the Sunday. When we saw the Enhanced Recovery Nurse the previous week she said that the surgeon likes to do his “interesting” patients early morning and that I was one of the “interesting” ones. It brought to mind the Chinese saying/curse “May you live in interesting times”. From then on it was just a waiting game until Sunday when I would get the call telling me which ward I needed to report to. The last full day of being able to drive for at least six weeks so we decided to go out for the afternoon to see the autumn tints at the National Trust’s Sheffield Park Garden. In the evening I made a final list of chores that needed to be completed the following day before I got the call from St.Thomas’s telling me which ward to report to and when they wanted me. I decided to see just how far down the list I could get. I was under strict instructions not to leave home until the hospital had rung but had been assured that they would find me a bed and that the op would go ahead on Monday unless the surgeon fell off his bike again. Since he had done that last year they were hoping he had learned his lesson. I always knew that this day would be the worst in the process so far. The admission letter told me not to leave home until the hospital had contacted me with the name of the ward I was to report to and at what time. All the chores were completed in the morning and then we waited for the call. It got to half past two and the tension was just too great so I rang the ward I thought I was being admitted to. Rather worryingly I was told that they had no record of me but would do some ringing around and let me know what was happening. About 10 minutes later I got a call to say that there wasn’t an available bed in Page Ward but I would be expected in Howard Ward instead. They would call me back to confirm when I was needed. We had a quick look at the St.Thomas’s website and couldn’t see Howard Ward listed. More worry. I then got a call from Howard Ward to say that I could come in as soon as I was ready and that I was getting a single room in the Private wing of the hospital but not to get too comfortable as it was for one night only. This really was the most stressful time for myself and my wife but as soon as we set off for London I relaxed and then became positively chilled out. Unfortunately it wasn’t so easy for my wife. If anything my laid back attitude made those around me more anxious. My sister picked us up and took us down to the station and we all boarded the train to Waterloo. We walked up from the station to St.Thomas’ and arrived just after half past four. Howard Ward is on the twelfth (top) floor of the hospital and entrance is via a set of locked doors. It took a while to find someone to let us in and eventually were greeted by a friendly ward sister who showed us to my room. 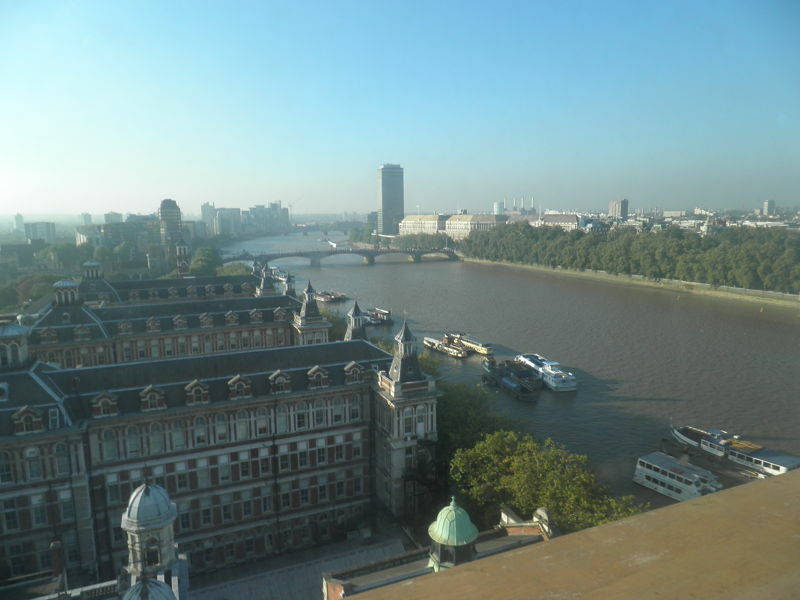 The first impression was “Wow, what a view” as we looked south down the Thames and over to the Houses of Parliament. Just before six o’clock I said my goodbyes to my wife and sister, wondering, at the back of my mind, if that would be the last time I would see them. I don’t want to sound over dramatic but it was a possibility. Apart from that one doubt I was remarkably calm and collected (and have been so ever since, no matter what my health has thrown at me. I wish I could pass the secret on to others but it simply happened and not as the result of a conscious effort). The ward sister returned to check my details, blood pressure and heart rate and take some MRSA swabs. Then we were joined by a doctor who stuck a cannula in the back of my hand and took some blood samples. I was allowed to eat up until midnight but after that it was to be fluids only. My dinner arrived and I ate it whilst watching the river traffic passing up and down the Thames. Mainly pleasure boats packed with people for an evening cruise, taking advantage of the autumn sunshine. When I had finished my dinner I was connected up to a drip and told to expect another visit from a doctor around 11:00pm. Once you’ve been operated on they like to get you down into the main surgical wards as there are more staff around to keep an eye on you. I still didn’t know what time the operation would be and wouldn’t be able to find out until the surgeon arrived in the morning. 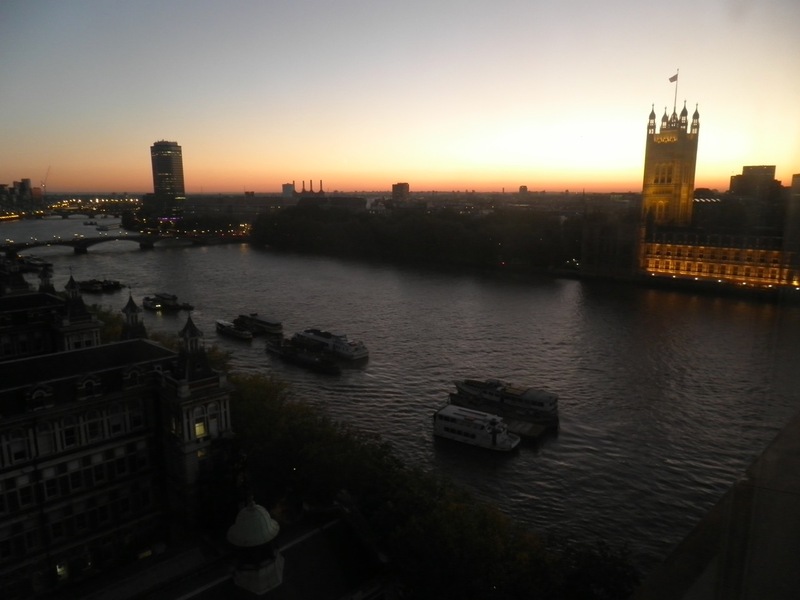 I took the opportunity to spend the next few minutes chilling out, watching the sun set over the River Thames. The next update to my blog would be after the operation. It would probably be at least Tuesday before I would be in a fit state to type further entries. Into the unknown……..but what a view. I was amazed that I managed to get some sleep. I was woken up at 2:00am by one of the nurses to connect a new drip and then went back to sleep. The next time I woke it was a glorious autumn morning. One of the house doctors came in, introduced himself and explained I was the last on the list for surgery as I was the most “interesting” and they didn’t know how long the operation would take. He answered any questions I had and then went off to the operating theatre. I was given DVT stockings and a surgical gown to put on. I lay on the bed watching the sun rise over Millbank. I was then visited by the anaesthetist. He said that it looked like I would be going down to theatre at 11:00am and it could be a 5 hour operation. There were some formalities that he needed to run through which revolved around risks and consent forms. He explained that they intended to use an epidural for pain control. Whilst this had proved very effective there were a number of risks involved. He went through each one in turn and gave me the probability of each occurring. At the end of it I signed a consent form that confirmed I understood the risks and I was prepared to go ahead with the operation.